If you go out of Antananarivo, you may notice “empty” pieces of land (no construction, no farming) surrounded by brown walls. These walls are the “tamboho gasy”. 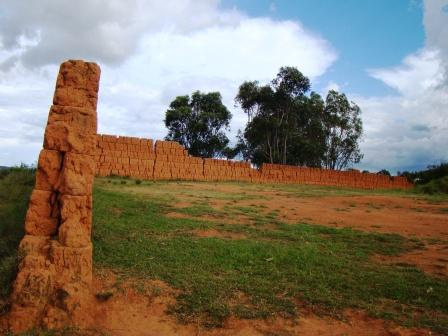 The new generation people, Malagasy and foreigners, are always amazed seeing these walls knowing that they were made more than a hundred years ago. Like any other kids, in my childhood, I used to ask a lot of questions on how, why… things were made. I remember, one day, I was in the garden with my father and my eyes were attracted by one side of our fence which was different from the other walls. Then, I started to ask questions. My father explained that it was a “tambohon’ny Ntaolo” (Malagasy Ancestors’ fence) and it was made with soil, water and cow dung. Transparency international revealed on its report that since the beginning of the transition, the situation of the corruption in Madagascar has worsened. According to such report, Madagascar is now at the 13rd rank on a list of 178 countries. All public sectors of the state administration are “infected”. Tahina promotes an e-petition supported by the WWF to stop illegal logging in Madagascar.